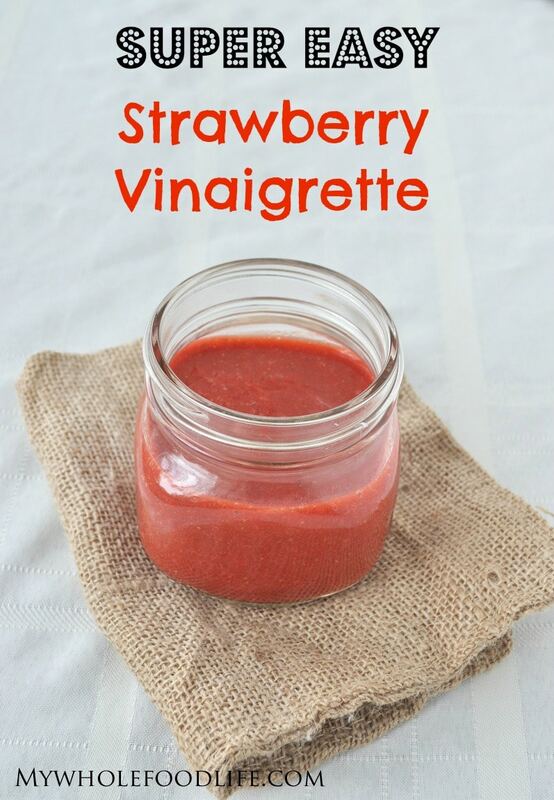 Easy Strawberry Vinaigrette. I have a new dressing recipe for you! It’s strawberry vinaigrette. This time it’s an easy dressing that is perfect for spring. I already have a balsamic vinaigrette on the blog. This oil free strawberry vinaigrette recipe is a twist on that. If you like homemade condiments, you may want to also check out this post on 16 Whole Food Recipes for Condiments, Dressings and Spreads. It’s so easy and a great way to use up those fresh strawberries. I suppose you could also use frozen strawberries in this dressing recipe. I would just let them thaw out first. You can make this in just about five minutes. I like to keep my homemade strawberry vinaigrette in mason jars. They are perfect. In a small blender, combine all the ingredients and mix until smooth. It took about 90 seconds in my Blendtec Twister Jar. Serve immediately, or store in an airtight container for up to 2 weeks. Enjoy! My granddaughter is Celiac and am going to try the flourless cookies that are here. Thanks! The flourless cookies are AMAZING you must try them you wont be disappointed ..
What would you use this with?? It would be great on a spinach salad. It might make a good marinade too! This is just luscious --- I'm obsessed with fruit vinegars and vinaigrettes this year --- I eat them by the spoonful! This looks delicious, I'm going to try it on lentil salad later today! I've always wanted to try strawberry vinaigrette....never thought it was so simple :) thanks for sharing! You are so welcome Melissa! I hope you enjoy it! I made this as soon as you posted it on fb. It is so tasty! We had it on a spinach salad today. The hubs loved it as well. So glad you liked it! The cookbook is due to come out mid December. I hope to know more details soon! do you think a strawberry vinagrette will be good with a cucumber salad? You might be able to omit it? I was going to post on the FB group last night if you had any fruit vinagarettes! I wanted to wait until I could search with my computer -- and look what came up in my feed! :) I'm caught up with a not-so-good-for-you raspberry walnut vinagarette, so this is going to be my replacement. Thanks! You're welcome Christina! I hope you enjoy it. Could you use 2 cups of fresh raspberries in place of the strawberries? Would anything else change in order to make a raspberry vinaigrette? I made this dressing this evening, added to greens, fresh strawberries, fresh blueberries and walnuts. It was delicious and a big hit with my family. Thank you for all the recipes and I bought and love your cookbook! Thanks Brenda! I am glad you liked it. Could I replace the red wine vinegar (I'm out!) with more balsamic or rice vinegar? Does anyone know roughly the nutrition profile of this dressing? Or at least the calories?